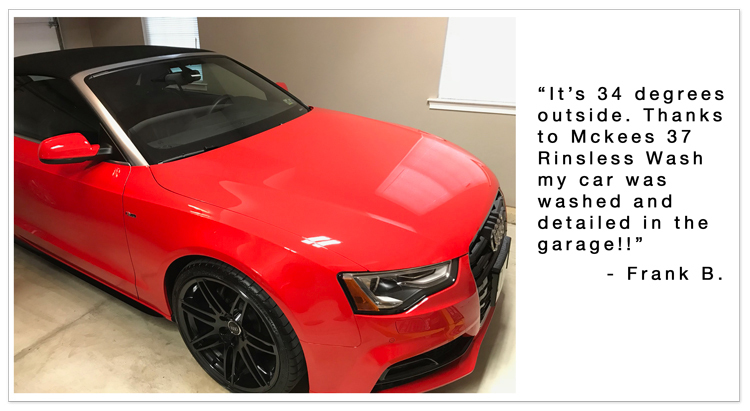 McKee's 37 Rinse Free Wash & Wax is a high gloss rinseless wash that enables you to wash your car without a hose or a free flowing source of water! Works Well 5 First time trying this as a rinse less wash. I have used this as a fast spray wax before and was impressed with the results. Followed the directions for a rinsle less wash application and was blown away! This may be my go to wash method in the future and not just for cold winter days. Joel C Lake Havasu City AZ. Great spray wax 5 I bought this upon watching the video that shows you how to mix this to make a spray wax. I bought the product and was amazed at how it works. Left the paint slick and did a great job to make my silver paint pop. My dad used it on his 55 chevy with single stage paint and it did great. Outstanding product, and it smell great. Pros:Shine, water beading, easy to use, very affordable, lives up to its name. Slick & Glow 5 I've been a WG Uber user till I found this rinse less. It lifts dirt well, very slick feeling, and leaves a nice glow/shine behind as you dry. Overall very cost efficient & works well with either a MF mitt or a handful of MF towels. Pros:Slick & Lifts dirt well. Rinse Free Wash & Wax 5 One of my favorite products that McKee's 37 has to offer, It leaves an incredible shine behind after a rinseless wash. I also mixed it up as a quick detailer like the site suggests and It works excellent as a spray wax/quick detailer. Works great on glass and wheels aswell! Highly recommend!